Regarding consummation of the transaction for the sale of Toshiba Memory Corporation (TMC), Toshiba Corporation announced that all conditions necessary to close the sale of all shares of Toshiba Memory Corporation (TMC), a wholly-owned subsidiary of Toshiba, to K.K. Pangea (hereinafter Pangea), a special purpose company formed and controlled by a consortium led by Bain Capital Private Equity, LP, had been met, and that the closing of the transaction was expected to occur on June 1, 2018. Toshiba hereby gives notice that the closing of the sale has been completed as scheduled. As a result of the closing, TMC, which had been deemed a specified subsidiary company under applicable regulations, has been deconsolidated from Toshiba Group, and going forward is expected to be treated as an affiliate accounted for by the equity method. The purchase price is approximately ¥2 trillion, 300 million. Toshiba received a special dividend from TMC of approximately ¥118.0 billion funded from TMC’s other capital surplus on March 29, 2018, in accordance with the share purchase agreement. 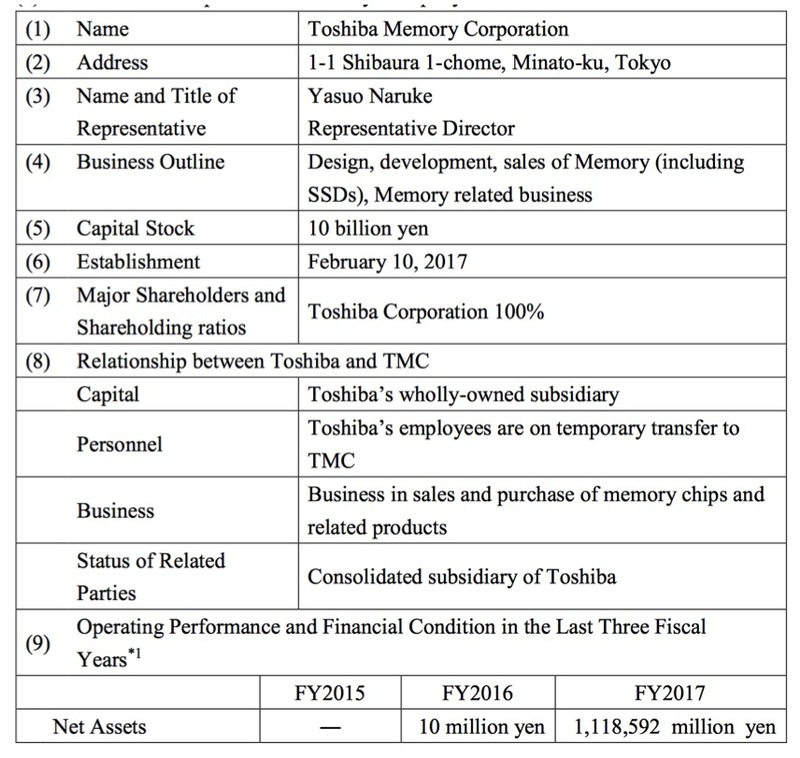 The purchase price was calculated by adjusting the difference between estimates of TMC’s net debt, working capital and accumulated capital expenditure as of the last day of last month that Toshiba provided to Pangea in accordance with the share purchase agreement, and target amounts for each, as mutually agreed by the parties. Post-closing, the parties will further confirm the difference between the estimated amounts and the actual amounts and will make any required adjustments to the purchase price. Shares or equity interests (mochibun) in Flash Partners, Ltd., Flash Alliance, Ltd., and Flash Forward LLC, the three manufacturing joint venture companies established by Toshiba Group and Western Digital Corp.‘s SanDisk unit, were previously transferred to TMC in January, 2018. 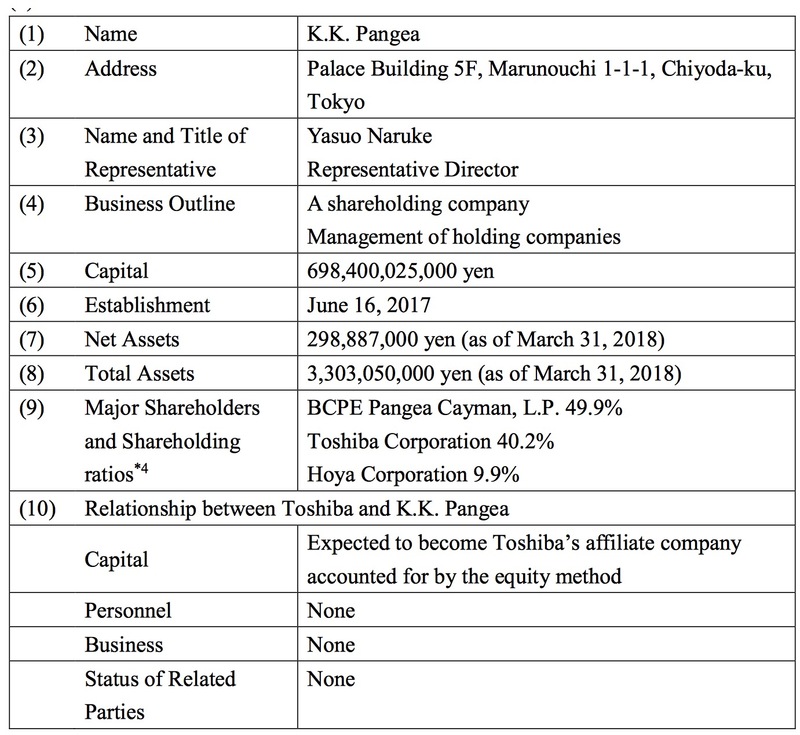 Toshiba has re-invested a total of ¥350.5 billion in Pangea: approximately ¥109.6 billion in common stock with voting rights (approximately 40.2% of the issued common June 1, 2018 Toshiba Corporation stock); and approximately ¥240.9 billion in convertible preferred stock (approximately 40.8% of the issued convertible preferred stock). As a result, Toshiba has acquired approximately 40.2% of the voting rights in Pangea. It has granted each of Innovation Network Corporation of Japan and Development Bank of Japan, Inc. both of which have expressed interest in investing in Pangea, instruction rights* for 16.7% of its voting rights. The closing of the sale and the re-investment deconsolidates TMC from Toshiba Group, and going forward TMC will be treated as an affiliate accounted for by the equity method. Note: Instruction rights give a third party the right to instruct the owner of shares in respect of its exercise of its voting rights, though in certain circumstances Toshiba retains the right to exercise its voting rights at its own discretion. *1: TMC was established on February 10, 2017, and took over operation of the memory business on April 1, 2017. Accordingly, its FY2016 figures include only its financial status for the non-operational period. *2: In addition to TMC, 14 other companies will be deconsolidated from Toshiba Group and become Pangea’s subsidiaries or affiliates as a result of the sale. *5: The purchase price was calculated by adjusting the difference between estimates of TMC’s net debt, working capital and accumulated capital expenditure as of the last day of last month that Toshiba provided to Pangea in accordance with the share purchase agreement. The parties will further confirm the difference between the estimated amounts and the actual amounts and will make any required adjustments to the purchase price. *6: Due to Toshiba’s re-investment in Pangea, TMC is expected to become an affiliate of Toshiba accounted for by the equity method. As a result of the sale and re-investment, Toshiba will record a profit from the sale of approximately ¥970.0 billion (before tax) in its FY2018 consolidated business results. The FY2018 consolidated business results forecast announced on May 15, 2018 made allowance for the closing of the sale and the re-investment by FY2018 1Q and is unchanged. The impact on Toshiba’s non-consolidated business results is still under review, and figures may be revised to reflect a ¥1.2 trillion improvement in net income. The book value of TMC’s shares in Toshiba’s non-consolidated accounts, the basis in calculating the profit from the sale, is different from that in Toshiba’ consolidated accounts, causing a difference between Toshiba’s consolidated and non-consolidated business results. On May 15, 2018, in ‘Development of the Toshiba Next Plan,’ Toshiba announced that it would create the ‘Toshiba Next Plan,’ a five-year transformation plan, and announce the details of the plan within this year. In creating the plan, Toshiba will consider and determine allocations of resources, including investments in growth, structural reform, financial solidity, impact on credit ratings, and shareholder returns, such as share buybacks, from the perspective of maximizing the company’s enterprise value. With regards to financial solidity and the impact on credit ratings, Toshiba will take into account evaluations by rating agencies, as well as the medium- and long-term shareholders’ equity ratios of competitors. Also, Toshiba will consider implementing early shareholder returns through measures that include closing its accounts to prepare temporary financial statements (non- consolidated) after FY2018 2Q to incorporate the profit from the sale into the non- consolidated distributable amount. Toshiba also intends to implement early shareholder returns proactively after disclosure of the Toshiba Next Plan, and will decide the actual measures and timing taking into account legal and other restrictions, such as insider trading regulations under the Financial Instruments and Exchange Act and the Companies Act. Toshiba will promptly announce any matters that require further disclosure.